In large bowl, mix dry cake mix and remaining 1/4 teaspoon ground cinnamon. Cut in butter with pastry blender or two knives until size of small peas. Dump on top of apple mixture. Cover; cook on High heat setting 2 1/2 to 3 hours or until fruit is bubbling and cobbler topping is light golden brown. Serve immediately with whipped cream. Slow cookers vary from brand to brand. Check on cobbler at 2 hours. If you love a dump cake, this clever cobbler recipe is for you! It uses a similar approach – apples, sugar and spice are combined in a baking dish and topped with a butter-cake mixture – except in this case, your baking dish is a slow cooker. As strange as that may sound, this recipe actually works beautifully. As the cake mix bakes in the steamy environment of a slow cooker it develops a soft, biscuity texture – just like your favorite cobbler. And the fact that this recipe relies on a slow cooker makes it perfect for those early autumn days when the weather is still warm. 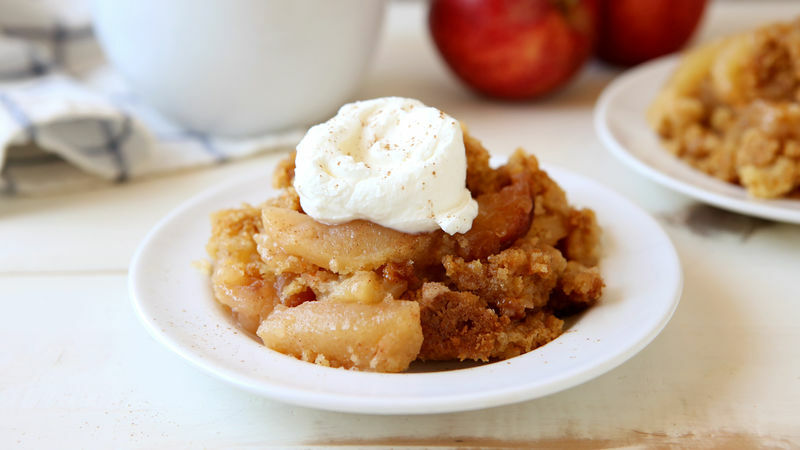 So, give this slow-cooker apple cobbler recipe a try when the market is loaded with fresh fall apples and you have a hankering for a baked apple dessert! Psst... later in the season, you can try the rest of Betty’s apple crisp and cobbler recipes. And in the meantime, learn everything you need to know about baking with apples.